When discussing affiliate marketing, there are at least two schools of thought about who should earn the affiliate commission which results from a successful sale. This is referred to as attribution. Some argue that it should be the affiliate who attracted the first click. Others argue that since it’s the last click which gets the sale, then it’s that click which should earn the commission. The arguments are a bit more complex than that. Before we start on this, just in case anyone doesn’t know what retargeting is, here’s a brief explanation. Essentially, it’s a technique that helps a merchant remind a prospective customer of the merchant’s existence. The prospect visits the merchant’s site and, in the process, picks up a cookie. This cookie is a message to sites displaying ads from the retargeting provider that the prospect has visited the merchant’s site and that the merchant’s ads may therefore be displayed. From the marketer’s point of view, a purchase involves far more than a customer simply going into a shop or visiting an ecommerce website, handing over money and receiving the goods or services. The handing over of money comes at the end of a process of preparation called the purchase funnel. 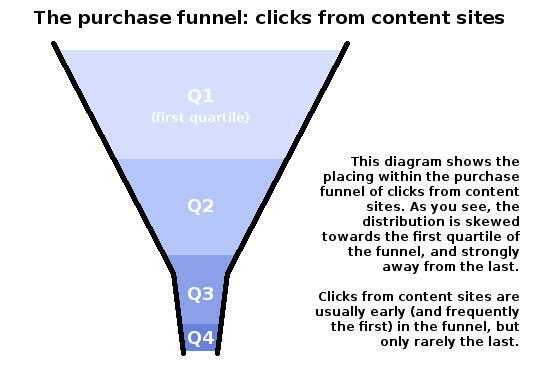 The purchase funnel is a theoretical marketing model used to describe the events or activities that may occur on the consumer’s path to purchase. Some models simplify this process into three parts of the funnel – awareness, consideration, and purchase. 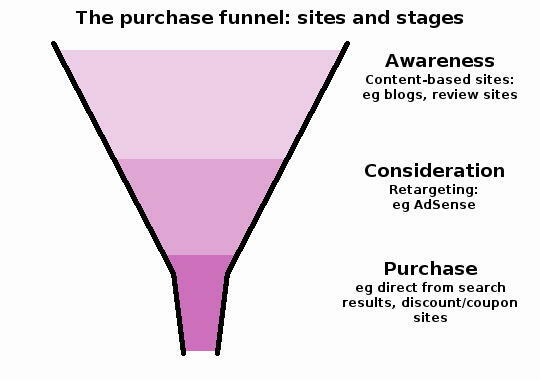 Other models of the purchase funnel consist of several more components, eg pre-awareness, awareness, research and familiarity, opinion and short list, consideration and, finally, purchase. It’s also possible to extend the model further post-purchase to include the intent (or not) to repurchase, but for our purposes today, the simplified model of awareness, consideration and purchase, is sufficient. Different types of sites play different roles at each stage of the funnel. At the awareness stage, it’s often content sites which are doing the initial work to pull in the potential customer. This original content, for example blogs and review sites, helps to increase the consumer’s awareness of the product. It may also improve the brand awareness of the advertiser. Assuming that most people don’t buy immediately (apparently 98% don’t), then the potential customer is likely to surf around during his decision-making process. He may be looking at other related sites or for something entirely different. Retargeting means that it doesn’t matter what he’s now looking for. Having ensnared a potential customer who has passed through the awareness stage and is now at the consideration stage, retargeting moves in to shift the customer further down the funnel towards closing the deal and making the purchase. Regardless of what the potential customer is now looking for, if he visits any website with Google AdSense or similar then the same adverts for what he first clicked on will follow him around everywhere. And last click often wins. Consumers are typically exposed to a number of adverts on the path to conversion. For example (this is a real life one), Mr C asked me about stock photos. I told him I was affiliated with a stock photo site and he clicked through using my affiliate link. (It’s the 123rf link on the right-hand-side.) He was subsequently followed around by AdSense adverts for the photo site regardless of what he was surfing for next. I’m sure we’ve all experienced being followed by ads before. Until now, I’d just assumed that it was Google doing the retargeting. Now I realise that advertisers can buy a service which – to put it bluntly – swipes the affiliate’s lunch back off them. The third stage in our simplified model is the purchase itself. This is rarely made directly from the first click site. Instead it’s more usual for the purchase to occur via a discount code or coupon site, or from search. Therefore, the content creators go unrewarded for their efforts whilst those at the narrow end of the funnel reap the commissions. In cases where the last click has occurred from an AdSense advert, the customer clicks through to the seller’s site and is likely to purchase from there. This is good news for everyone except creators of content sites. It’s often cheaper for the advertiser to pay for AdWords than it is to pay affiliate commissions for referrals. It’s good for Google too, of course, because they increase their revenue by keeping their advertisers happy. It’s only the poor old content site creator who was at the top of the funnel who gets shafted. This makes me think that there’s a strong argument in favour of me going over to my AdSense account and blocking any merchant I’m affiliated with from showing their AdSense adverts on my site. Of course, that doesn’t stop the retargeting kicking in on any other sites which the potential customer might look at. Did you ever get the feeling that it seems the small guy just can’t win sometimes? Well, perhaps the small guy’s about to get a helping hand. Online marketing strategists are showing more interest in identifying exactly who it is that’s winning their sales for them, a process called attribution. Sounds good to me – let’s have a look!